Intellian Technologies' v65 Ku/Ka band convertible SATCOM system has been independently tested by satellite communications service provider Marlink and exceeds all expectations in terms of performance efficiency on the company’s newly launched 60 cm global network — these results represent a significant breakthrough in redefining expectations of what constitutes fast and reliable onboard connectivity for data dense applications through a compact VSAT system. The enhanced efficiency of Intellian’s v65 system when used in conjunction with today’s HTS reflects an advancement in capability. This is particularly pertinent for vessels that can only accommodate a smaller antenna. To verify the throughput speed, engineers at Marlink tested Intellian’s v65 VSAT system at the company’s state-of-the-art testing facility in Eik, Norway, along with other antennas of varying sizes. Testing was carried out on the Marlink Network using Intelsat 33e, the newest Intelsat EpicNG satellite to provide high throughput satellite Ku-band coverage to the EMEA region, to determine maximum throughput levels. Marlink concluded that Intellian’s v65 VSAT system, combined with the global coverage of Marlink’s Sealink VSAT and the advanced capabilities of the IS-33e high throughput satellite, allows ship owners access to high-end service packages that create opportunities to reduce cost, maximize uptime, and increase profitability. 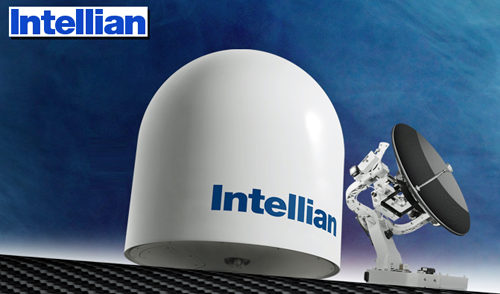 Launched in March 2017, Intellian’s v65 antenna is designed to drive the adoption of new connectivity solutions for fleet operators looking to enhance communications capabilities beyond legacy L-band systems. Featuring an updated design to reduce cabling and deliver plug and play installation capability, ships can install and activate the compact system within a few hours’ time, minimizing any potential for operational downtime. Mark Rasmussen, Vice President and General Manager, Mobility, for Intelsat, acknowledged that the performance of the Intelsat EpicNG platform overall has validated the company's design and strategy and is advancing Intelsat's vision of unlocking access to new, larger and faster-growing sectors. Ecosystem partners, such as Marlink and Intellian, are innovating to maximize the customer benefit from the higher performance, better economics and simpler access provided by Intelsat EpicNG, providing a real game-changer for maritime networks. Tore Morten Olsen, President Maritime, Marlink, added that in a market with ever-increasing expectations for faster and smoother connectivity, the firm has been keenly focused on working with their partners to develop an innovative approach to delivering the best in practice solutions, ensuring that customers receive a comprehensive and reliable satellite communications service to suit them. Matthew Galston, Strategic Marketing Director at Intellian, added his thoughts that the launch of Marlink’s Sealink VSAT service via 60 cm Ku-band antennas genuinely redefines expectations of what constitutes fast and reliable onboard connectivity. It has opened the market to a wider customer base, and created opportunities to achieve greater, more cost effective and more reliable service for vessels which can only accommodate a smaller antenna. The improved transmit speed capability is particularly important to note, as over time more data will need to flow from the ship back to shore, or perhaps ship to cloud to enable the industry’s digital transformation.